We didn't expect to find much of interest in a dramatic oratorio with a religious theme, especially one sung in English. But. Big but. Where William Remmers goes, we follow. Such is the cred he has built with us after several years of engaging and stimulating productions by Utopia Opera. 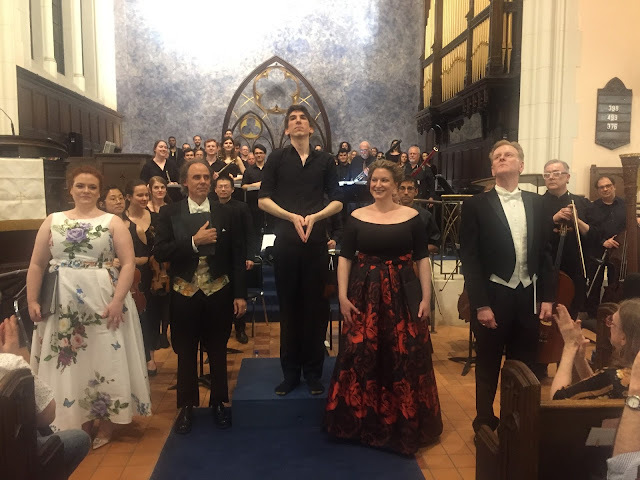 The most impressive part of the performance was seeing what Maestro Remmers could achieve with a full orchestra in the sanctuary of Rutgers Presbyterian Church on the Upper West Side. His conducting is astute and highly energetic, and a bit balletic. We couldn't help noticing that The Utopia Opera Choir, having sounded rather muddy in the first scene, became suddenly crisp and clean in the second scene when he left the podium (whilst we were dazzled by an outstanding organ solo, performed by Mary Nelson) and focused his conducting attention on the choir. The setup in the sanctuary put the strings at audience level with winds elevated on the stage and the choir behind. The splendid soloists sang in front of the strings, and therefore behind Mr. Remmers. It all worked just fine. Although we knew that Arthur Sullivan had written serious music, we never paid much attention to it, since it is rarely heard on symphony programs. When we think of Sullivan, it is generally in connection with his partnership with W.S. Gilbert, with whom he wrote so many wickedly humorous and satirical operettas--works that are often heard on professional stages, not to mention in schools and summer camps. What a discovery to hear Sullivan's late Romantic style in its full glory. With the help of Gilbert in adapting the poem of Rev. Henry Hart Milman, a work of musical and spiritual value was created. It premiered as a piece d'occasion at the Leeds Music Festival in 1880 with Mr. Sullivan on the podium; last night was the United States premiere of the orchestral version. If, dear reader, you are interested in details about the changes wrought by G&S on Milman's text, we refer you to gsarchive.net. Let it be noted that the text is in iambic pentameter; whereas the original is in blank verse. Gilbert ensured that we would have some rhymes to tickle the ear. The work takes place in Syria in the 3rd c. and involves the martyrdom of Margarita (the daughter of Callias, the Priest of Apollo) who has converted to Christianity. The poem celebrates the steadfastness of her faith as she sacrifices her love for Olybius, the Roman Prefect and probably her life. With 21st c. cynicism, we see it as the stubbornness of a delusion. As the martyr Margarita, the stunning soprano of Alexis Cregger filled the nave with clear bright sound that thrilled the ear. The sweet tenor instrument of Adam C.J.Klein was just right for his aria "Come, Margarita, come!" in Scene 1; he became more forceful in Scene 3 when he tried to persuade Margarita, and he darkened the color appropriately for their confrontation when she refused to relent. Duncan Hartman's dark bass was perfect for the role of Callias, the pompous priest of Apollo, who was understandably stentorian when angry at his daughter's betrayal of the family faith. Their confrontation was rather chilling and made for a fine duet. Utopia Opera regular Caroline Tye used her rich chocolatey mezzo-soprano in the role of Julia, the speaker of the choir. She colored her voice even darker as she opined that Margarita would die. If we are not mistaken, this role was not in the original poem but was created by G&S. And we are glad they did! Baritone Kevin Miller sang well in the small role of Fabius, Bishop of Antioch. We liked the mellow sound of his voice. Except for the choir, all the soloists enunciated clearly so that the text could be understood. We never take that skill for granted. We enjoyed Evan Chertok's gusto on the timpani as well as Mr. Remmers' picking up some of the percussion by striking the triangle. We have never before seen a conductor do so. Mélanie Genin's harp solo accompanying Margarita's ode to her lyre was a special treat, as was the cello solo in scene 2. It was a fine evening, full of surprises and enlightenment. We love to be surprised and we love to be enlightened.